How to Make DNS Propagation Faster and Save From DNS Hijacking ? Is there any way ? Yes there are ways and will work with 100% warranty. No one can steal yours. DNS Propagation never takes more than 15 minutes for a newly registered domain in case the host is Rackspace and the domain is bought from third party. Officially DNS Propagation takes up to 48 hours, but keep in mind, as Rackspace uses white labeled IP, DNS Servers never takes very long time. If you are ask How to Make DNS Propagation Faster for the reason that you have bought a domain from a third party, changed the NS set and now your website is looking like a parked website, this is an automated script based temporary DNS hijacking to fetch money from Ads. .pro, .edu, .ac etc. domains (reserved domains) which needs other register for verification, i.e. normally not available through, for example Rackspace (Tucows) are quite vulnerable to get delayed or will be redirected to a junk webpage like a parked webpage. There is no proof to show that it is the domain register who is doing it, but I have seen to do this by namecheap and net4.in, the later is needed for reserved domains. Government usually never suffers as they have own department for acting as domain register. It can happen with medium to big blogs, websites too. Always try to buy domain from Tucows (or through Rackspace), GoDaddy etc. domain registers. Some people says, the API of the reseller works wrongly or have some flaw that creates these sort of problem. I honestly do not believe it. If they were innocent, they should point to other HTTP header error, not land you to parked like pages. With webpage test you can see what pages are shown to the visitors ! You can read about Domain Hijacking and DNS Hijacking here. Cloud Fare security settings should always be at highest. 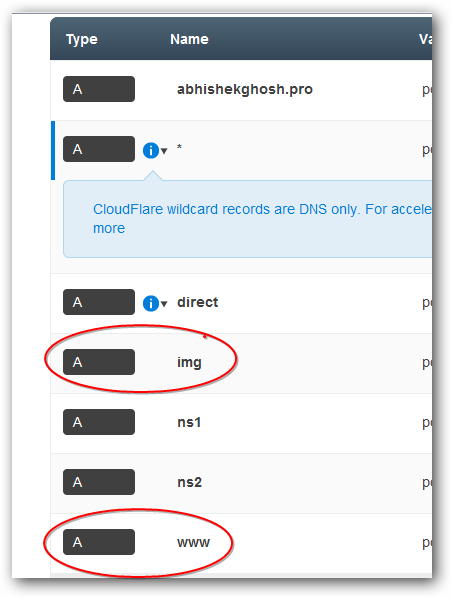 The above shows, Cloud Flare detected the hidden settings of A Record and suggested to use a wildcard A Record (the resellers uses a script for NS chnging things, you can not edit A Record after changing the NS). Cloud Flare overrides any wrong doings, technical error by those resellers, you can edit the A records again from Cloud Flare account. Now it is pointing towards Rackspace rightly in my case. Do not buy domain other than from Tucows, GoDaddy with the exceptional cases like me. Second if you face these problem, use Cloud Flare to override. Third is, after 60 days, transfer your domain to your trusted register and obviously you can use the default NS pair (for Rackspace in my case). It is a temporary fix, not permanent. Forth is, use .htaccess to 301 redirect all those odd A records looking like subdomains to your main domain. Not only your question, How to Make DNS Propagation Faster is answered but you came to know many unknown things. Cite this article as: Abhishek Ghosh, "How to Make DNS Propagation Faster and Save From DNS Hijacking," in The Customize Windows, October 4, 2012, April 20, 2019, https://thecustomizewindows.com/2012/10/how-to-make-dns-propagation-faster-and-save-from-dns-hijacking/.